This was a decent attempt to put Stevenson’s story on the stage, but suffered from the usual problems of such adaptations – having to shift scenes very quickly as well as coping with visual changes which are done much more easily on TV and film. The cast did a reasonable job overall, and Phil Daniels created two clearly distinct performances as Jekyll and Hyde. The addition of a singer for this production was largely wasted on me, and I found the gloomy lighting a problem at times, as with increasing age I need more light to see by, not less. But this performance certainly kept my attention much better than the afternoon’s offerings, for which I was grateful. The set had to accommodate several locations, and while it wasn’t the most sophisticated I’ve ever seen, it did the job pretty well. An upper balcony stretched across the centre of the stage, with a spiral staircase at the left side. Underneath was a filler wall which could be either the doors to Jekyll’s sister’s garden or the fireplace of Jekyll’s flat. For other locations it was usually left open. There were doors at either side of the wide stage, and an additional door, coloured bright red, in Jekyll’s lodgings, this being the door to the lab. Once through this door, a tall rack of glass bottles containing coloured liquids masked the right-hand door, while a table and overhead light took centre stage. With all of the furnishings removed, the stage became a gloomy London street. The costumes and décor all contributed to the murky nature of the production. Dark clothes and dark paintwork made for dismal surroundings, but the cast did their best to keep things moving, and for the most part it worked quite well. My main problem was with the maid, Annie. It took me a long time to adjust to her accent, probably because it travelled round the British Isles at a fair lick. If it had settled down in one place, I would have been alright. Steve and I heard hints of Irish, Scottish and West Country, and that, combined with a tendency to gabble her lines, meant I got very little from her part at all. Since she was the one in the lab with Jekyll/Hyde at the end, when the final revelations were being presented, I lost most of the connection I’d had with the plot and found myself looking at my watch more than once. Even so, we enjoyed ourselves well enough, along with the rest of the audience. This was a definite improvement on my experience of 20 days ago; not quite enough to warrant a 10/10 rating, but oh so close. There were three factors involved in this change: the first and most influential was our prior knowledge of the play, which meant we could follow the arguments better and appreciate the political exchanges as well as the personal stories. As we suspected, this play does benefit from some advance knowledge of the people and the situation. The second factor was the talk we’d had at the Winter School this afternoon, not only us but the entire group, of course. As a result we were a more responsive audience than before, and that naturally enhanced the experience for us. And finally there were almost certainly some improvements in the performance, but as we were in different seats, and given the effect of the other two factors, I have absolutely no idea what they were. I did notice some things that I either missed last time around or got wrong. The Yorkshire rant about the constant changes to religious practices was done by the church warden, not the Lady of the manor. Before we visited Tyndale’s cell, there was a short scene at the back showing the priest being blessed by, I assume, the Pope; there was lots of singing and fancy dress. The second half started with the candles on the triangular chandeliers being lit by the choir, who then stood and sang for a bit before the play continued: again, the singing was a bit too dissonant for my taste, but I may have been warming to it. In the Yorkshire scene, I forgot to mention last time that the church warden came back into the church while the clerk and the chaplain were having their discussion, and lurked behind the screens to overhear them. We suspected later on that he may have been the one who betrayed the clerk to the authorities in revenge for his treatment of the windows, amongst other things. I found the story much more moving this time, with plenty of sniffling opportunities along the way. I understood better the Bishop of Ely’s guilt at having been so harsh to the prisoners he visited, as represented by the Puritan clerk. 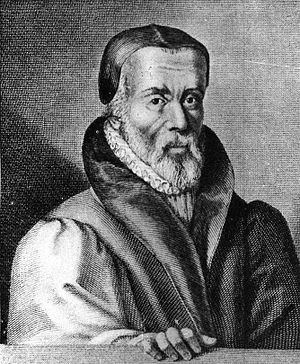 That scene, of the prison visit, was played out in front of the Bishop, and I got the impression that Tyndale knew about it and forgave the man. The parallel with Tyndale’s own experience has only just become apparent to me; I claim the mercy of the court on account of my increasing years. Or senility. Or both. The massive amount of exposition didn’t seem so clunky this time around, which helped, and the humour worked just as well if not better. I liked the way they went through some of the Biblical words and expressions that we use today, often disparaging them; ‘beautiful’ and ‘allegory’ are the only two I can remember off hand. It was not only amusing, but also a good way to link the story to the present. The maid’s rant at the end had less of an impact on me this time – may have been the angle we were seeing it from – and I could see in the Bishop of Ely’s discussion with her that he may well have been thinking of the Civil War to come, although I also take it as a reference to all future religious disputes based on rigidity and intolerance. From today’s talk, I gathered that there were in fact only 47 translators involved in the work; I’m not sure where the 54 mentioned in the play came from, although Steve reckons that was the number they started with, but six years of translation took its toll. Very like. The opening scene of this new play by David Edgar was well complicated, with all sorts of historical characters, done up in drag most of ‘em, chattering on about different bits of the Christian Bible and which English word they should use for which Hebrew, Latin or Greek one. This was a hastily summoned meeting of several of the important members of the translation committee (who were 54 men in total) with the Bishop of Ely (at his London residence apparently) to finalise the last few controversial verses of the new King James Bible. It was hard to follow and a little dry at times, but as we learned in the post-show session, David Edgar had likened this bit to The West Wing, where no quarter is given to the uninitiated audience, and characters talk freely and fast in full blown jargon until we catch up. Fortunately there was also some humour to keep us going, mainly through the political aspects of the different choices, and with the Bishop refusing to put in an appearance for a while (busy praying) the stage gradually cleared so that we could savour some discussions between just two or three characters at a time. Much easier to follow, and now I felt I was getting a handle on the debates. A lot was at stake, literally in the case of the Protestant Martyrs burned by Queen Mary, and it was enlightening to see such passions involved in what to us is now a very abstruse and academic subject. This first scene was set in London in 1610. The next scene took us to Flanders in 1536, while the third scene, set in Yorkshire in 1586, bridged the gap between then and 1610, to which we returned for the final scenes. For Flanders, a small square platform rose up from the bowels of the stage, containing a table and chair, a stool, an unlit stove, and William Tyndale. This was Tyndale’s prison cell, and as he was due to be executed very soon, a Catholic priest had been sent to persuade him to recant his ‘heretical’ views, particularly those relating to his translation of the Bible into English. He refused, and in his heartfelt urging of the importance of a Bible that a ploughboy could read for himself, he converted the young priest to his way of thinking. As a result, Tyndale’s translations of several more books of the Old Testament were rescued by the priest, just in the nick of time. The guard, helpfully setting a fire in the hitherto unused stove, was planning to use Tyndale’s work as kindling; the priest deftly substituted his own now worthless papers about Tyndale’s ‘crimes’, and secured the precious translations for posterity. They had one minor problem with this scene when the candle, blown out to distract the guard, unhelpfully went out a second time before its cue, but never mind. I did find the long opening section of this scene a bit too gloomy, in terms of the lighting rather than the mood, but I appreciate it’s a tough call when Tyndale’s main complaint is that he hasn’t been allowed any artificial light in his cell, thereby hindering his work. They had to give us a lot of information at the start of this scene, to establish who was who, when, what had happened, etc., and on the whole this worked OK, although I was surprised that Tyndale had to explain what the Pentateuch was to a priest. However I know a lot of that was to explain it to the audience, and I’m sure many of them were grateful for that. Oliver Ford Davies explained at the post-show that with David Edgar, you had to keep pushing him to explain things so the audience can follow what’s going on. He’s worked with David on a number of plays now, so he spoke from experience, and with feeling. The next scene, in Yorkshire, is set during Elizabeth’s reign, and shows the visit of a group of clergy to a small church which does not appear to have done everything it could to remove all traces of Popery. There are still stained glass windows, pictures of saints have been reapplied to the whitewashed panels within the building (intruders, apparently) and there’s no record of the disposal of the gold chalice or some ornate vestments. The visiting group have the authority to punish the churchwarden for these offences, and one chap, a clerk, is just about to smash the windows when a local lord and his wife turn up and try to put a stop to it. It doesn’t help that this Lord isn’t as familiar with the Ten Commandments and Articles of Faith of the Church of England as he ought to be to take Communion, but at least he distracts the clerk from his mission of destruction. With some stiff warnings to the errant churchwarden, and his promise to get rid of the remaining Catholic accoutrements, the group is relatively satisfied with their work. At the start of this scene, the young priest from Tyndale’s cell met the Archdeacon who leads the visiting group, and after a little while I realised this was the same man at two stages in his career. The archdeacon used Tyndale’s very words when expounding on the necessary changes to religious practices, and it was very interesting to see that, despite being ignored and rejected during his lifetime, Tyndale’s approach had finally become the accepted norm in England. During the course of this scene, we also get to see a discussion between the clerk, a rampant Puritan, and the Chaplain, who turns out to be a younger version of the Bishop of Ely – this is how the scenes bridge between the time zones. I didn’t follow all of their conversation, but I did gather that the Puritans were keen to disassociate themselves from the ‘impure’ in society (judge not, least ye be judged?) and the chaplain was strongly against that idea, seeing the divisions it would cause. In the second half, which is all set in London, we get flashbacks to this earlier time, with the clerk now in chains being visited by the chaplain, who has been given the same task as the young priest in the second scene – get the man to confess to save his soul. It’s not entirely clear, but it seems that the Bishop of Ely is full of guilt over his treatment of this man, whom he may have betrayed to the authorities, and whose fate he almost seems to relish. To return to the end of this third scene, the chaplain buys the chalice off the churchwarden, claiming that he can get a better price for it in York than the churchwarden could get locally, and then as the Bishop comes on stage for the end of the first half (we have covered a lot of ground, haven’t we?) passes the chalice to him. The second half begins with the Bishop at prayer, yet again, kneeling at the altar at the back of the stage. Samuel Ward, one of the translators with a serious concern about allowing any hint of Catholic terminology into the King James Version, brings on a pile of books, a pile which he’d taken from the Bishop’s servant to take to the Bishop at the end of the first scene, another nice link. They have another chat about the choices facing them; the Bishop just wants to wash his hands of the whole thing and leave the decisions to others, while Ward is vociferous in his convictions about how a number of the verses should be translated. Then things get a little more complicated. After Ward leaves, the Bishop still wants help with the situation, and suddenly hears a voice speaking to him. A moment or two later, Tyndale (the ghost of) walks on stage, and there follows a most entertaining conversation between the two men, with the Bishop bringing Tyndale up to date on the rash of English Bibles since his time (and even an officially approved one during Tyndale’s last year on earth!) and Tyndale having a good old rant about how much of the Catholic tradition is still flourishing in the ostensibly Protestant Church of England. It really brought home both how much of Tyndale’s battle had been won and how much had been lost. During their conversation, we see the flashback to the younger version of the Bishop, visiting the clerk in prison, and when that finishes Tyndale has gone and the translators have turned up. Tyndale’s dictation to the Bishop, resolving the contested verses, is seized upon by the rest of the committee members as giving them the finality they need. Unfortunately the paper gets blotted with ink (the Bishop being clumsy) and they can’t read it all. Prince Henry turns up, the Prince of Wales, with his younger brother Charles, the future king. With Henry taking charge of the discussion, the decisions are made surprisingly quickly for once, and the resulting hodgepodge, which includes the classic ‘swords into ploughshares’, is quickly taken to the printers. With the departure of the Royal entourage and most of the committee members, the Bishop has a change of heart, and accepts his servant’s offer to write a letter at his dictation to the Archbishop of Canterbury to suggest the revisions may themselves need to be revised. His servant, a woman who was brought up on the English Bible and the stories of the martyrs – her grandmother was one of those burned as a heretic in Mary’s reign – does the writing OK, but she gets very upset at the idea of changing the word of God. Her fanatical zeal for leaving things as they are (in which case the Bible she adores would still be in Latin, if not Hebrew) is terrifying, and gives a clear link to some of the religious issues facing us today, where a little learning coupled with passionate beliefs can have horrific results. However, she does agree to take the letter, and after she leaves, the Bishop starts looking up the sources for some lines from Genesis. Tyndale makes a handy reappearance to help him, and the play finishes with these men facing each other over the texts on the table. Although I found it hard going at the start, once we got into Tyndale’s story it all flowed much better. The humour was lovely, and there was lots of it. I felt for the poor folk in Yorkshire; the Lord’s wife expressed the difficulty so many people had when they were told to worship one way, then it was changed, then changed back again, and yet again. They just wanted to be left in peace to do things the way they’d always done them. The linking of the scenes with the younger and older versions of characters was nicely done, and again the author hasn’t taken sides in this debate, just shown us the sort of things that went on to increase our understanding; we can all make up our own minds about the issues, of course. The crucial aspect of the whole piece is the way that Tyndale (right) emphasises the heart rather than the head; this stops it being just an intellectual debate which could have become very boring. I found I could relate to the characters and their situations, and it left me feeling I understood more of that period and the huge importance placed on theological ideas. Earthly kingdoms were at risk, never mind heavenly ones. I hadn’t realised how much I expected to hear the King James Version, and how odd some of the others sounded, although I found I preferred some of the alternatives on offer and I have a sense of liberation now that I don’t have to take any translation as gospel! The set was pretty impressive, making the Swan feel very much like a church for most of the performance. There were carved arches with central double doors screening off the rear of the stage; these were dressed differently for the different locations. Four large circular candelabras were lit at one point, and apart from the platform for scene two there were tables and chairs brought on and off as needed. The costumes were period – this led to one approving comment from a member of the audience later – and there was music between scenes. The singers were good, but there was a little too much dissonance in the music for me. The performances were all excellent, especially those of the two central characters, Tyndale (Stephen Boxer) and the Bishop of Ely (Oliver Ford Davies). Almost the entire cast came out for the post-show, and there were some very good questions again tonight. The cast had eleven weeks for rehearsals, but this was split between two plays, so they had to move pretty sharpish from one rehearsal room to the other at times. They covered the difficulty of the massive amounts of exposition in the play, not to mention the relatively undramatic nature of the story, and they did a lot of research themselves into various related subjects. Jodie McNee, who played the Bishop’s servant Mary, researched the Protestant Martyrs, and discovered the story of a plough girl who was burned as a heretic. With Tyndale’s emphasis on ploughboys being able to read the word of God, this girl’s story was added to the script during Mary’s passionate speech at the end of the first scene. There was a lot more that I don’t remember now, but it was a thoughtful discussion with plenty of humour, as was the play. Having slept on it, I reckon this is such a detailed piece of work that it really needs to be seen at least twice to fully appreciate it; good job we’ve already booked. This was one of the good aspects of the production – it didn’t try to preach or moralise about the rights and wrongs of any situation, but did its best to let the characters tell their stories and leave the audience to take from it what they would. At the time, I felt that Nasrim was sincere in her beliefs, but without more information on her point of view, other than her holy book says this, or her culture says that, I’m left feeling that her character is ultimately the loser, as she remains ignorant of other possibilities for relating to people. I’m also in the dark as to why she wanted citizenship in the first place, and therefore it’s hard to assess her responses. If she wanted greater freedom and equality, then she needed to learn that other people are free too, free to choose what they want to do. It’s difficult to balance the operation of a tolerant society when there are those within it who are intolerant of those liberties – and that applies as much to our politicians as it does to immigrants or existing citizens. Still, it obviously got us thinking, and that’s no bad thing. To help the audience understand the new citizenship test, there were lots of information snippets through the play, more at the beginning and less later on as the characters developed and their situations took over the play. I did find some of the info stuff a bit boring. It was more like a lesson than a play at times. There was a screen along the back of the acting area, and a couple of times they used this to demonstrate the difference between the original citizenship manual “Life in the UK – A Journey to Citizenship”, and the second edition, which had been “simplified”. I suspect the excerpts used were meant to make a point, but I just found them confusing, apart from a couple of comparisons in the second set, which did at least make a small joke. It wasn’t always clear how the second version had been changed from the first, and so the effort was wasted on me. Apart from the screen, there was only the acting space, eight actors, lots of chairs and a couple of tables. The actors carried off numerous parts really well, and as their stories started to emerge, I began to enjoy the performance. At first it was dry and rather dull, but there were some interesting observations. The personal stories gave me more of an insight into some of the difficulties faced by immigrants who don’t know English particularly well, and whose cultures do nothing to prepare them for ours. One chap was constantly teased at work by his colleagues, who took his test book and kept asking him questions and poking fun at him. But they were silenced when he turned out to know a lot about football. And when one woman got her citizenship certificate, she was finally able to negotiate a better deal from her partner, who had been treating her more like property than a person. The fact that incomers to this country even have to be told that it’s an offence to be violent towards their partner is a shocking indictment of the treatment of women worldwide, and one reason why I still consider our culture more advantageous than some on the planet. We’re not perfect, but at least we seem to have learned some valuable lessons; I hope we don’t unlearn them in trying to treat all other cultures as equal to ours. We also attended the post-show discussion, but although there were some interesting comments, I didn’t learn more about the production than I’d already seen. Sadly, I didn’t think to ask what the title meant, so I’ve no idea how that relates to the play. On the whole I enjoyed it, but there were dull moments. First we attended the pre-show event in the Minerva, where Philip Franks chatted with David Edgar about this production and adaptation of Nicholas Nickleby. Both of them were knowledgeable and entertaining, so the time flew, and I’m not sure how much I can remember now. David covered the choice of play to adapt fairly briefly (there are notes in the program) and again emphasised how lucky it was that he agreed to do this book instead of Our Mutual Friend. What came across as he talked was that he isn’t as familiar with Dickens work as might be supposed. Philip talked about his enthusiasm for the full-length version first done at Stratford, which he visited regularly in his younger days. There was talk about the changes between last year’s production and this year, and Philip confirmed that there was more light and shade in the performances: Daniel Weyman as Nicholas had been determined to rise to the challenge last year, which was appropriate enough, but this year he knew he could do it and was now able to look for ways to play the young man unsure of how to handle the world and the situations he finds himself in. The scene where he has to decide whether to take Smike with him or not was much more moving this time, and I certainly felt the decision wasn’t an easy one. I asked if there were any changes David still wanted to make, and if the play had been translated at all. Both David and Philip answered the first point. David felt there had to come a time when you said “enough’s enough” and let the piece be, although there was still some tinkering even this year. Philip has a file called Reclaim, where he keeps all the bits he wants to see back in the production – by the time they get to Plymouth, it may be back to two four hour parts! This year, they had put back in some lines where Nicholas and Kate are showing Smike the house where they grew up, lines about how it always seemed to be summer then. On the translation point, the play has been translated, particularly into Swedish and Finnish, for some reason – not so much into other European languages. David appears to go to just about every production he can, and told us how strange it was to hear the Swedish version, where the only things he could make out were the proper names – a gabble of Swedish, then “Mrs Nagg”, etc. He also mentioned another version of his original, which had been done by a theatre group themselves, which brought out different aspects of the play, and Philip mentioned yet another version he’d seen, which David was surprised by – one he didn’t know about! There were other points, and all very entertaining, and the end came all too soon. But at least we had the pleasant prospect of a good evening’s entertainment. Steve noticed the cameras first – I was oblivious. This show was being recorded (I assume the matinee had also been filmed) as part of the Open University program. We speculated on whether the DVD will be available – if so, don‘t stand between us and the shelves or you may get knocked down in the rush! The performance started with a “previously, on Nicholas Nickleby”. The cast skimmed through the first half’s events in a wonderful way, introducing us to the characters again, and bringing us up to speed with the plot. It got a tremendous round of applause, and got the whole evening off to a great start. The second part of this story is a bit quieter, although there isn’t as much suffering on view. (Philip described it as being in a minor key at the pre-show). Nicholas gets to meet the Cheeryble brothers, and their superb cheerfulness lights up this half. They’re wearing bright orange wigs, and when Nicholas meets their nephew, we realise straightaway who he is once he takes off his hat and reveals the same colour of hair. Nicholas is back with his family, and all seems well, but Smike is poorly, and when Nicholas and Kate take him to see their childhood home, he’s so ill he dies. This was definitely an occasion for tears. Eventually, Uncle Ralph’s evil plans to make Nicholas suffer, and force an innocent girl into a disgusting marriage, come to nothing when Newman Noggs, overhearing the plan, takes matters into his own hands and saves the day. As Ralph Nickleby’s machinations collapse around him, he wanders the streets, trying to find some way out. This was well portrayed, and I felt much more the suffering that Ralph goes through before ending it all in the very bedroom Smike had lived in all those years ago. I felt there was a small chance that he could have changed things round, and become a better person, rather than seeing him as completely irredeemable, but it didn’t quite happen, sadly. With Ralph and his plots out of the way, all the various couples are free to marry and enjoy life, with many of them going on to happier and happier lives. Dotheboys Hall is trashed, by the remaining “scholars”, and a most sombre note is struck by showing us that these boys have nowhere else to go. One lad is left, freezing in the winter weather, until Nicholas finally rescues him – another tearful moment, and one that will probably go down very well this Christmas. All in all, I enjoyed this second romp through the Nickleby story. There was still plenty of humour, plenty of sentiment, and lots of energy from the cast. As the audience were pretty responsive, too, I hope they got some good footage for the OU. This was a completely different experience to last year’s performance. I suspect three factors were involved. One was that I had the headset, so could hear everything clearly, and in a play that uses words so well, that makes a big difference. Secondly, there were relatively few performances last year – only twenty of each, according to the post-show info – so the cast might not have got into full swing by the time we saw it. And thirdly, I was more familiar with the story, and could anticipate some things this time. For example, Smike’s line about following Nicholas to a “churchyard grave” got me sniffling straightaway tonight. There was too much going on for me to note it all down, so I’ll have to keep the descriptions fairly general. The set was much the same as last year, though I gather there were changes, such as the spiral staircase that caused so many problems during the final scene of Romeo and Juliet (it had a tendency to hang on to swords, spades, etc.). There was an upper walkway with doors off, the staircase, a general space in the middle, a step up from the surrounding stage level, and various doors including the wide sliding doors at the back that the schoolboys come through at Dotheboys Hall. There was a general air of shabbiness, but that soon changed when the swells were on stage; both costume and lighting gave the stage a completely different feel. The costume changes must have been frantic, as even with four extra actors (post-show again), the number of characters was mind-boggling. I was much more involved with the story from the start, and I enjoyed the energy of the chorus effect. In fact, I felt I could have done with even more of that at times, as the energy tended to drop a little when there were more straight scenes. I didn’t notice the recasting that much, as they all seemed to be working well together, and the story came across very much more clearly. I found the Dotheboys section almost too tough for me this time round. Even though the details weren’t particularly graphic, my emotional connection with it made me feel the depth of suffering so much more, and I had a few sniffles. In fact, I had a certain moistness of the eyes at various times through the performance, mostly caused by Smike, it must be said. Of course, the sad parts made an excellent contrast with the funny bits, and I enjoyed these a lot more second time around. Bob Barrett was one actor I remembered well from last year, and I felt his Browdie, the bluff Yorkshireman, was even better this time. I loved the humour of the misunderstanding between Nicholas and Fanny, and Nicholas’s completely inept handling of the situation. I also enjoyed the initial scene between the Nicklebys, just up from the country, and Uncle Ralph, played this time by David Yelland, who got across his character’s complete distaste for any sort of personal relationship, especially with his family, and his total devotion to acquiring money. There was a lot of humour in this, and I do hope the audience does some booing over the Christmas run in London. But the best bit of a very good performance was the final scene, showing us the effect the Victorian sensibilities had on the plays of Shakespeare. The advantage of the extra actors was that the Chichester stage, so often a vast wilderness which the cast prowl around trying to fill, was increasingly crowded with every character from the play, including the hapless apothecary, as the dead came back to life and all was bliss and rapture. I must admit to thinking, for one tenuous moment, that the Victorians had a point. After all, Juliet’s potion wasn’t deadly, so why shouldn’t Romeo’s be a placebo? But the thought didn’t last for long, as all the corpses from the freshly skewered to the three days rotting, jumped up to join in the curtain calls. There had already been a number of mishaps – bottle in the wrong hand, no dagger for Juliet so she had to grab a pickaxe – so the final resurrections just fitted right in. It was also lovely to have the whole cast finish the evening with a rousing song, as the music had been so good throughout I’d actually wanted a bit more singing. The post show nearly had more people on the stage than in the auditorium. I was even more impressed when Philip Franks told us they were busy working out how to adapt the production for a proscenium arch, so they obviously don’t have a lot of time to spare. The overall impression was of a company that’s working really well together, and nearly everyone contributed an answer to the questions. Philip and Jonathan worked really well together as co-directors, Philip in particular was singled out for major praise for his contribution in creating such a good team spirit (a willingness to walk over hot coals was mentioned). Details of the adaptation and the process of getting support for the tour etc. were covered, there was a feeling from last year that they hadn’t fully explored the production, and everyone was going on the tour plus London stint and trip to Canada (no glum faces that I could see). About half of the cast were new this year, and that had helped to bring extra energy into the mix. The audience were very appreciative, and I got the impression that a number of people had found this year’s offering even better than last year. I have to agree, and now I’m seriously (if that’s the right word) looking forward to Part 2. Tissues at the ready!